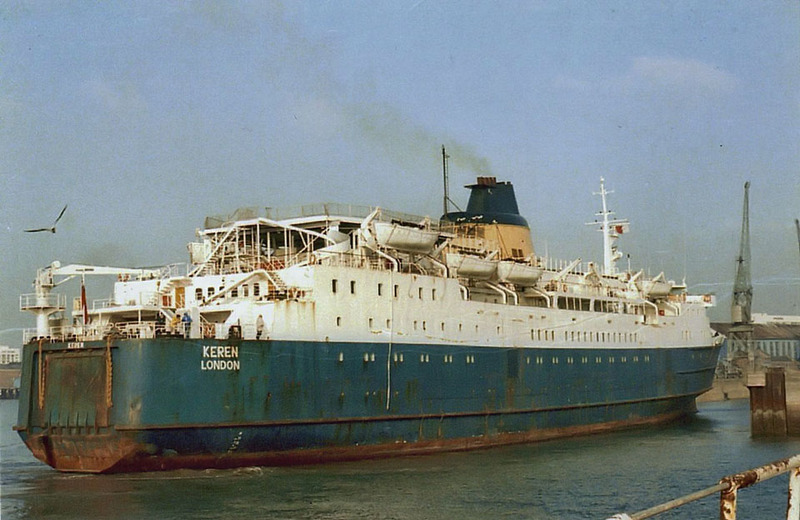 Registry: London, Nassau/Bahamas, Panama,Gibraltar, London, Nassau/Bahamas, Panama. 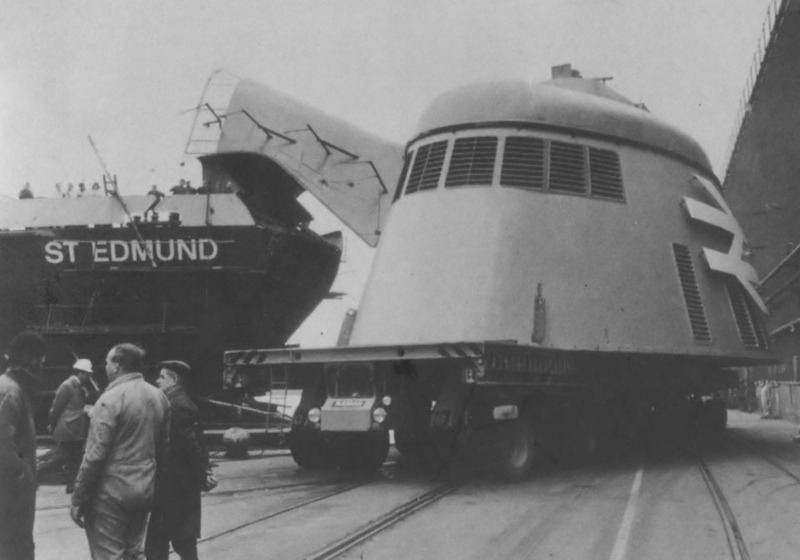 November 13th 1973: Due to be launched by Mrs Caroline Marsh, wife of the Managing Director of British Rail, but owing to a severe storm the launch was postponed until the following day. 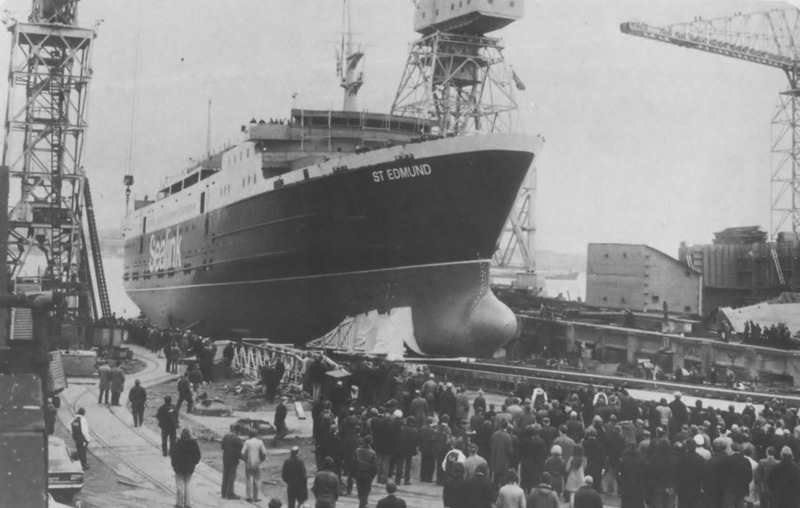 November 14th 1973: Christened and launched. 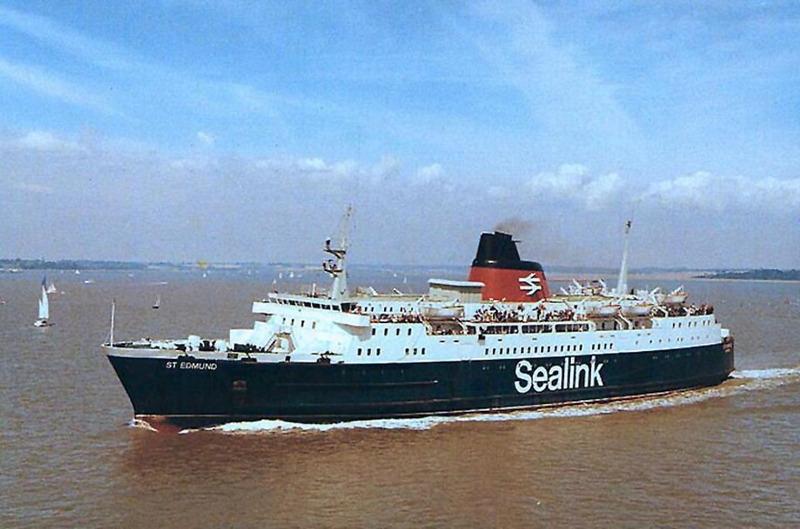 December 12th 1974: Sea trials and maiden voyage to Harwich. 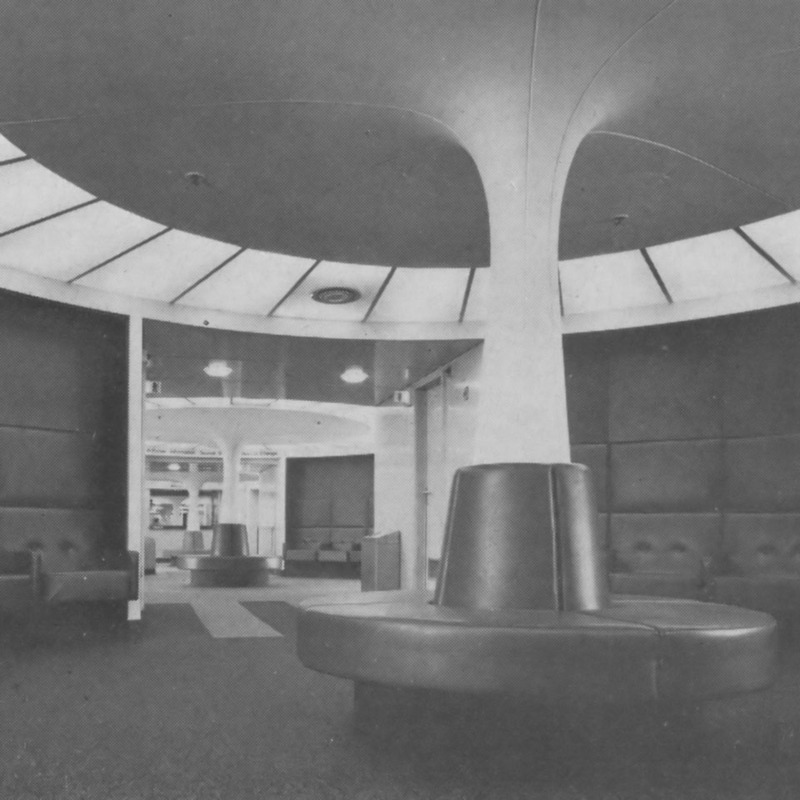 January 1975: Delivered to Passtruck (Shipping) Co. Ltd., London, (a subsidiary of British Rail). 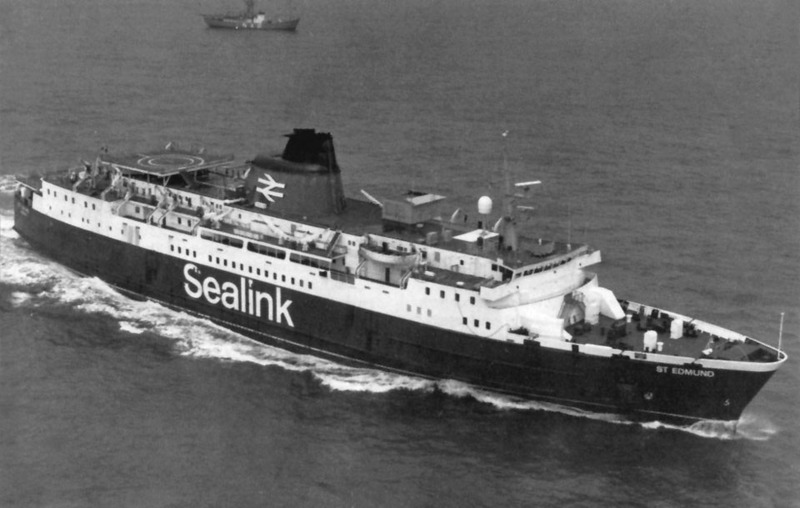 January 19th 1975: Introduced by Sealink into service between Harwich and the Hook of Holland. 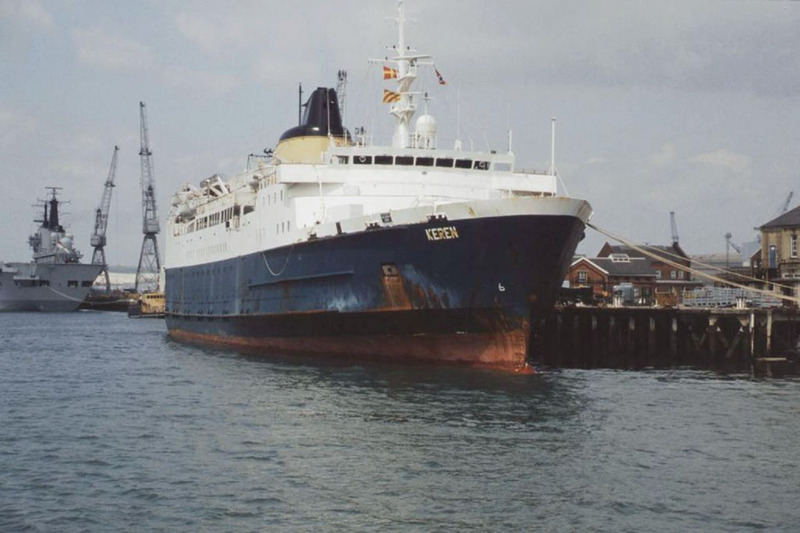 May 12th 1982: An “On hire” survey was carried out whilst the vessel was lying alongside at Parkeston Quay, Harwich. 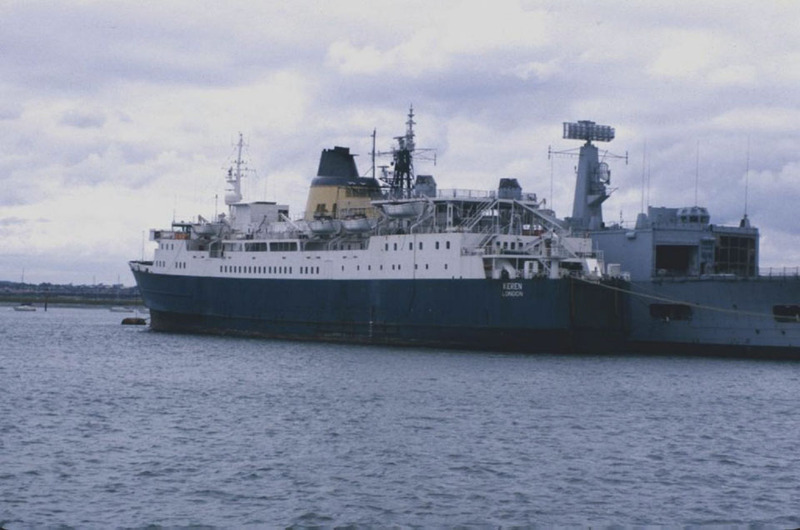 May 12th 1982: The British Ministry of Defence chartered her in the aftermath of the Falkland War. 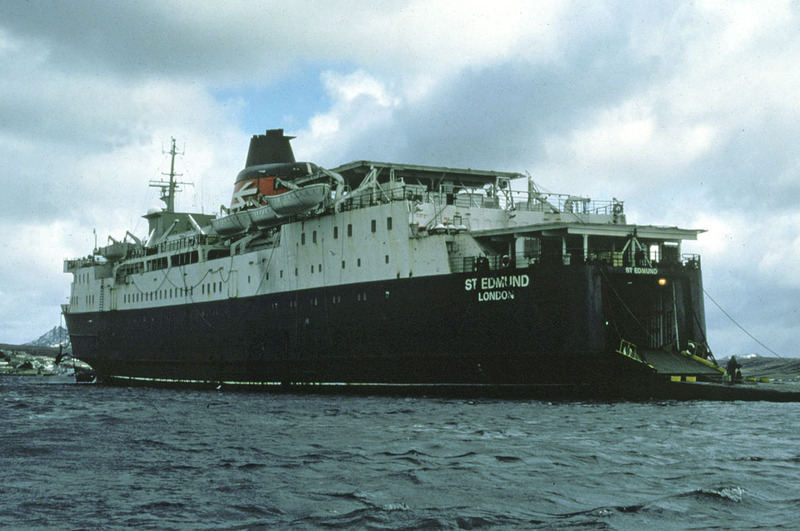 Managed by Blue Star Ship Management Ltd., Liverpool, with 5 Infantry Brigade she operated on a regular trooping run between Ascension Island and Port Stanley, capital of the Falkland Islands. 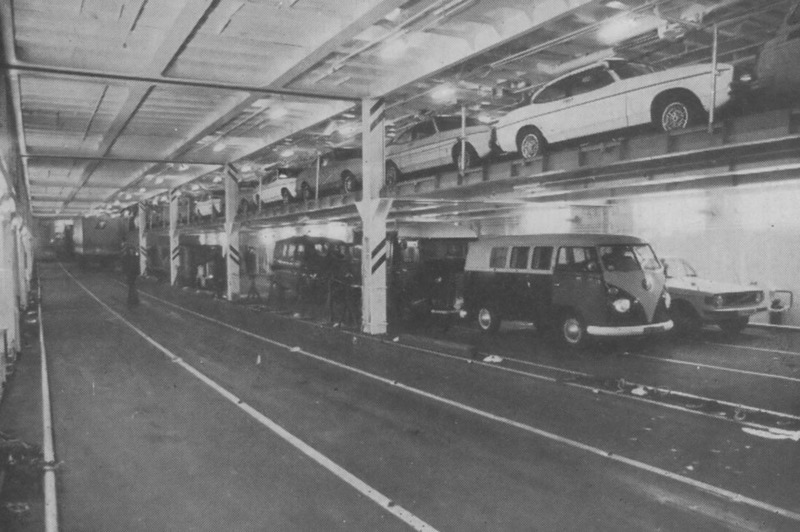 May 13th – May 19th 1982: Modified at Devonport as a troopship. 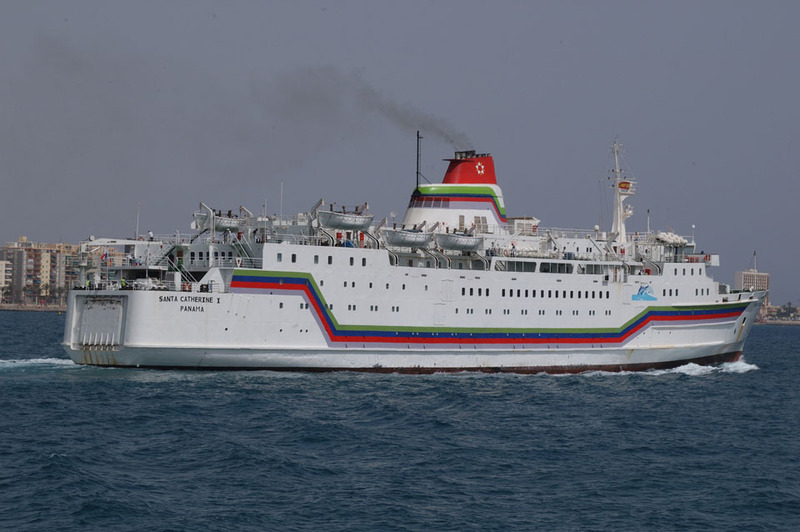 Received two helipads, satnav system, two freshwater generating plants, RAS gear, and had her accommodation modified. Loaded with 5 Brigade personnel and stores plus RAF detachments. 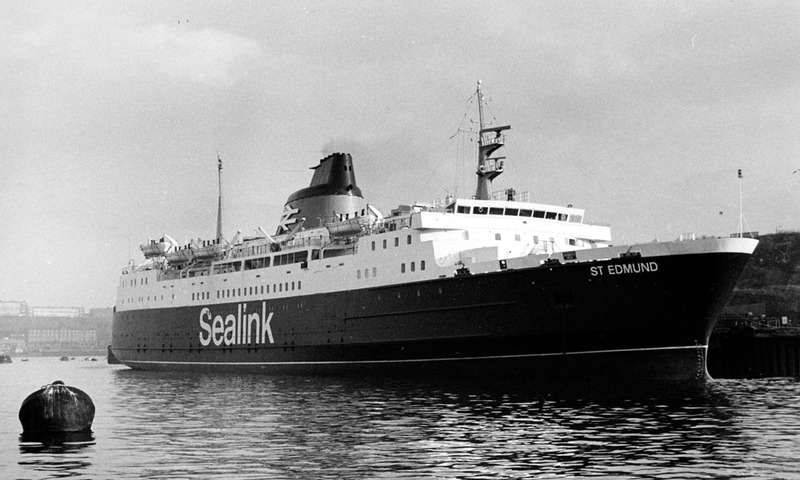 May 20th 1982: Left Devonport for The Falkland Islands. After the surrender she provided rest and recreation facilities for the troops. June 30th 1982: Took special category Argentine POW’s to Puerto Madryn. 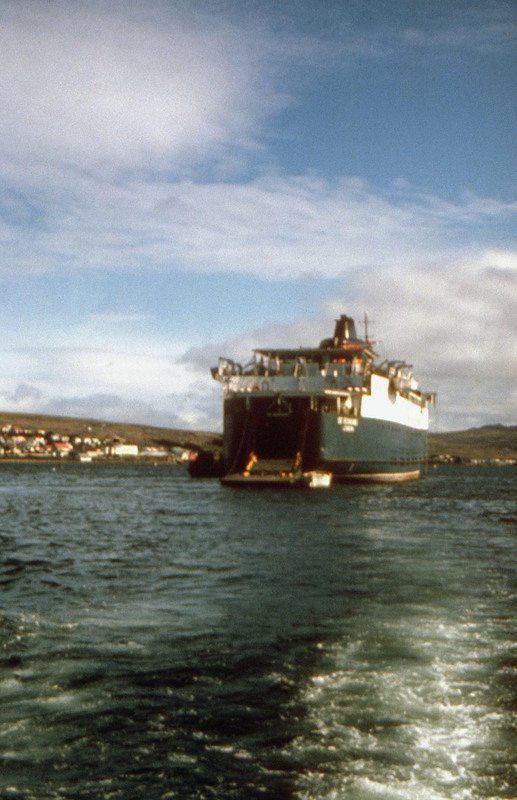 On return to the Falklands ferries troops and civilians to and from Ascension before becoming Port Stanley accommodation ship. 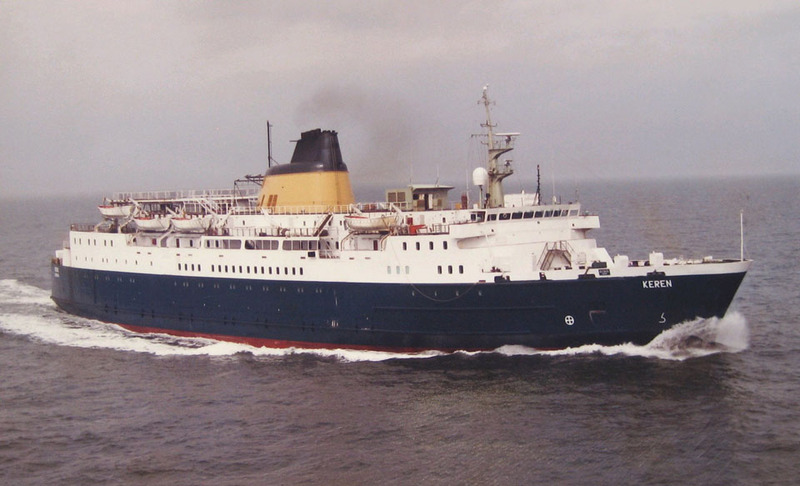 January 28th 1983: Arrived at Tyne Ship repairers, England where she was she was compulsorily purchased by the Ministry of Defence, London, England. 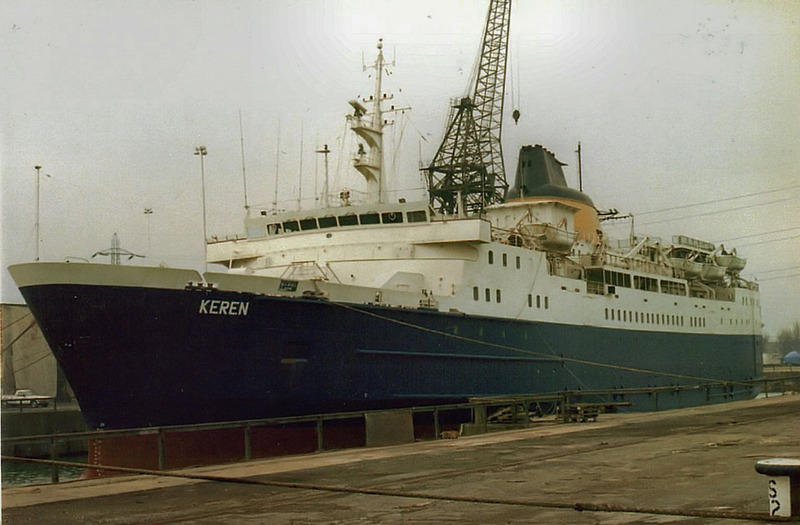 May 1983: Officially renamed HMS KEREN (nicknamed “The Stanley Hilton”). 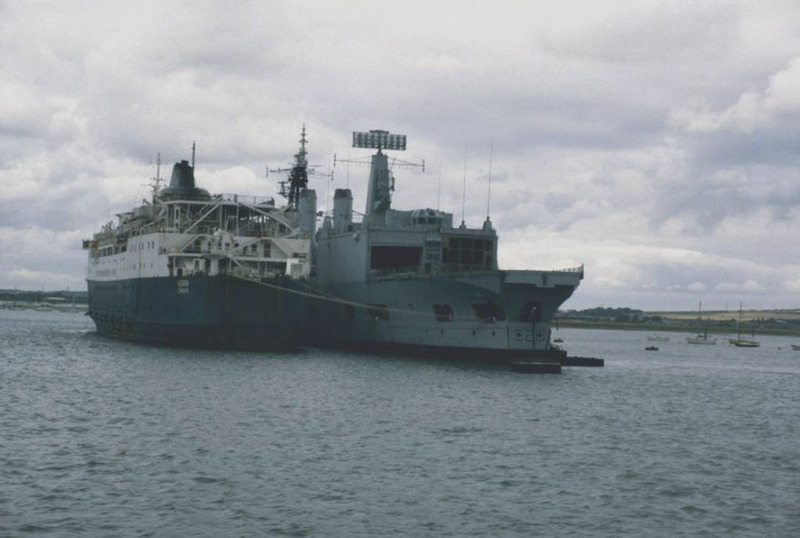 She returned to the Falklands and used as a floating landing stage. 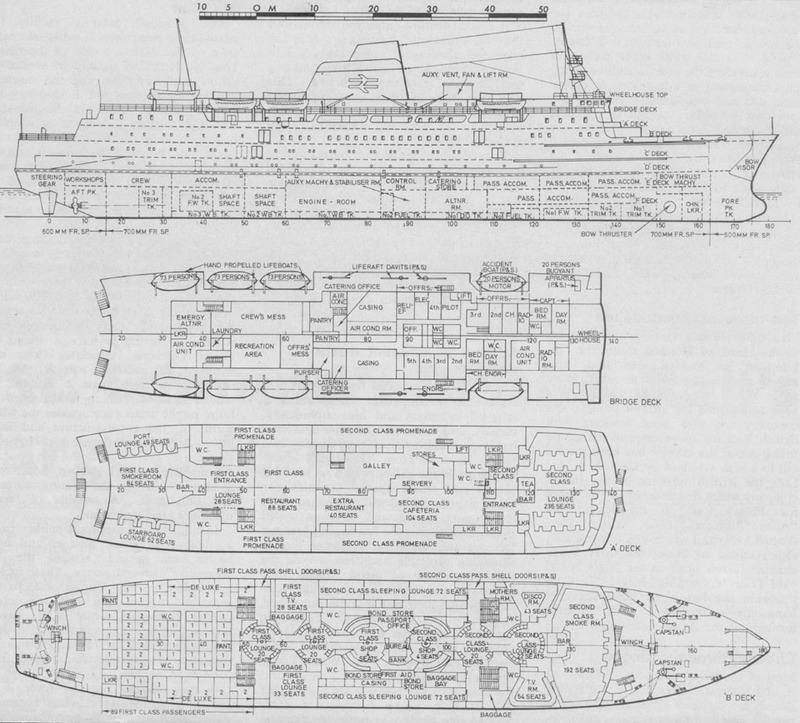 With the addition of extra-refrigerated storage carried in the car decks and a water osmosis plant, she carried approximately 1000 military personnel. 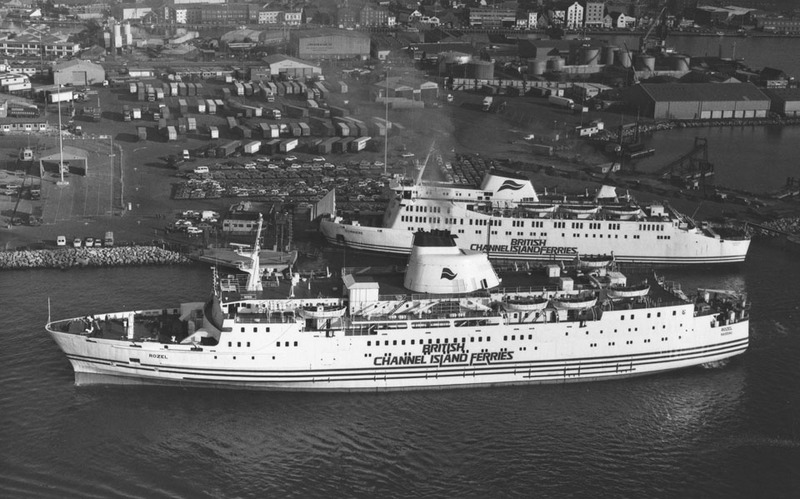 The “passengers” being ferried to and from the vessel by helicopter, using the added helicopter landing deck which can be seen aft of the funnel. 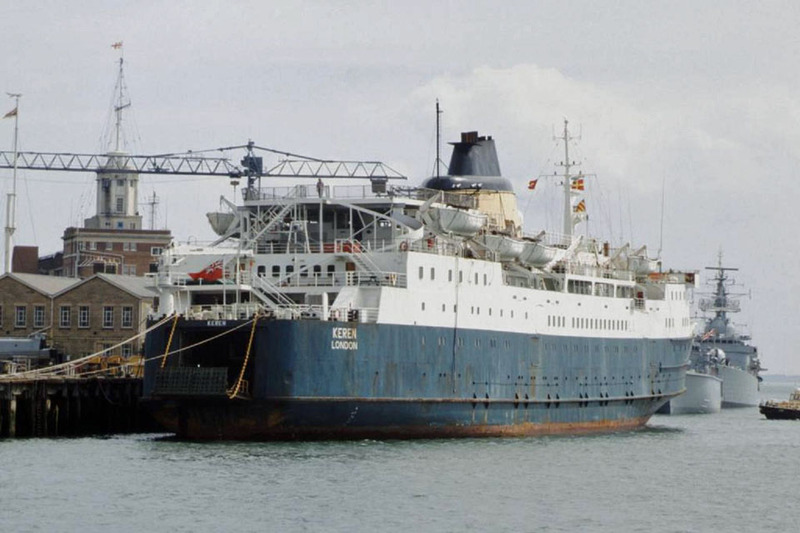 July 1985: She returned to the UK and, after a Government-funded refit at the Vosper Thornycroft Yard in Southampton, she was laid up near Portsmouth for sale. 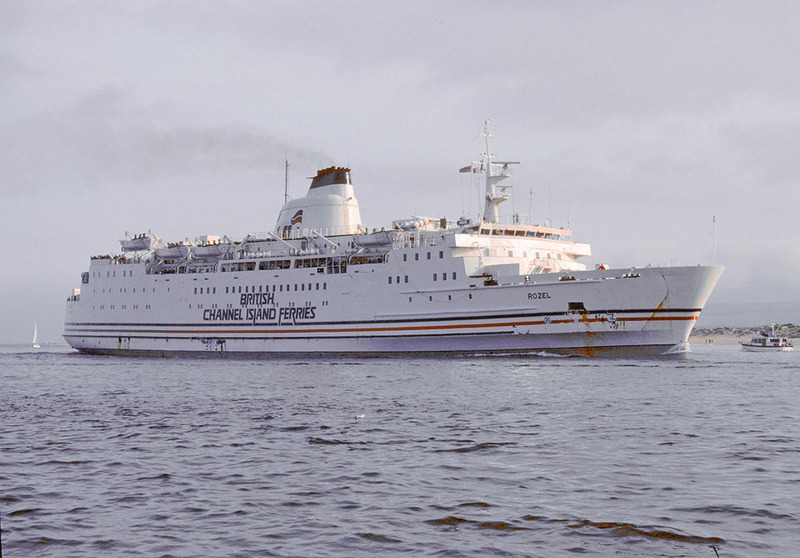 January 1986: Sold to the Cenargo Group who operated the Ferrimaroc service between Almeria, in southern Spain, and Nador, in north eastern Morocco. 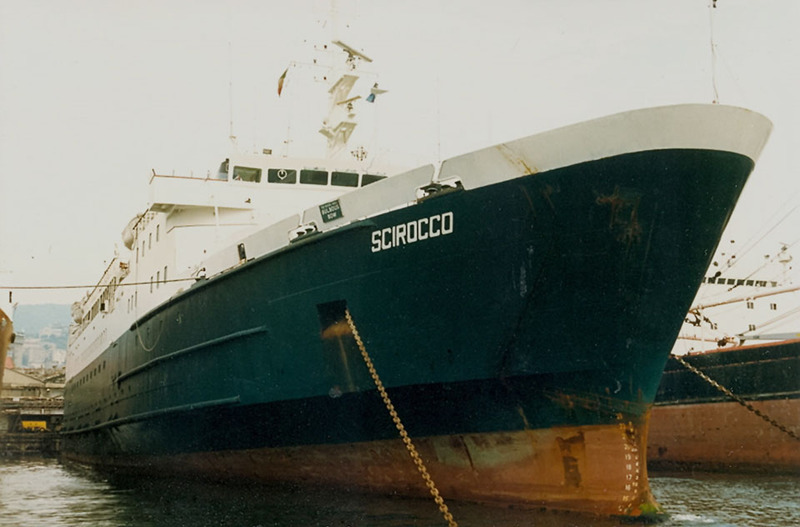 She was renamed SCIROCCO. 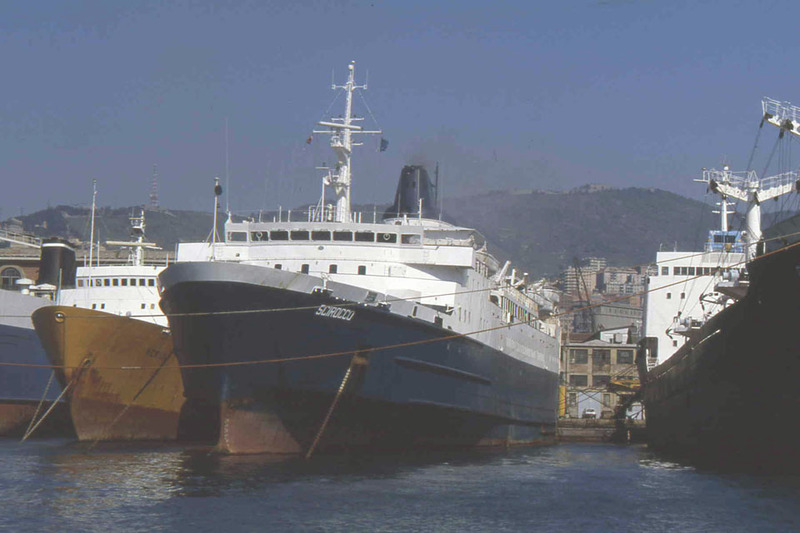 June 18th 1986 – September 16th 1986: Chartered to Tirrenia di Navigazione, Italy to run between Genoa and Sardinia, changing to Genoa – Alicante on October 3rd. 1987: Chartered to Comanav and then Cia. 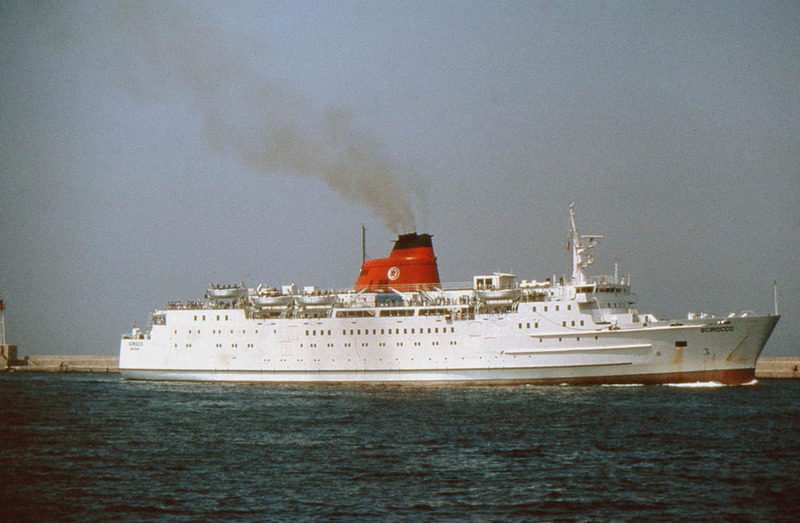 Trasmediterranea for Barcelona – Palma then in 1988 to Cotunav for the La Goulette – Marseilles route. 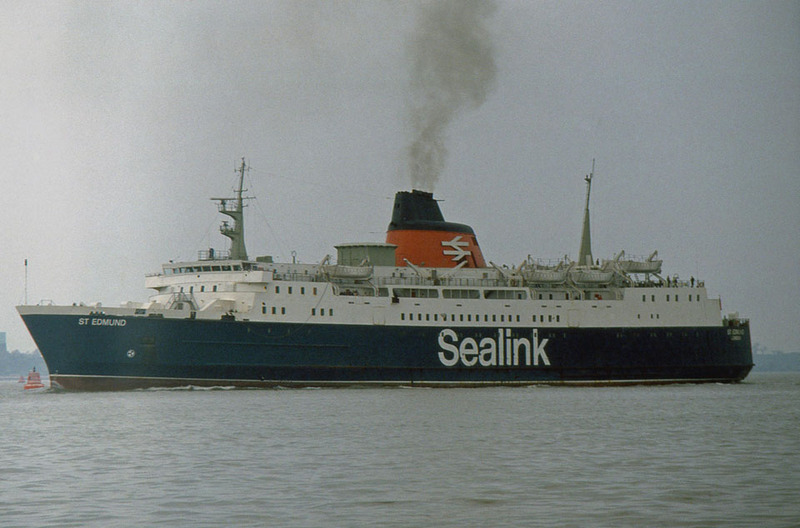 January 8th 1989: Arrived in Southampton where she was refurbished. 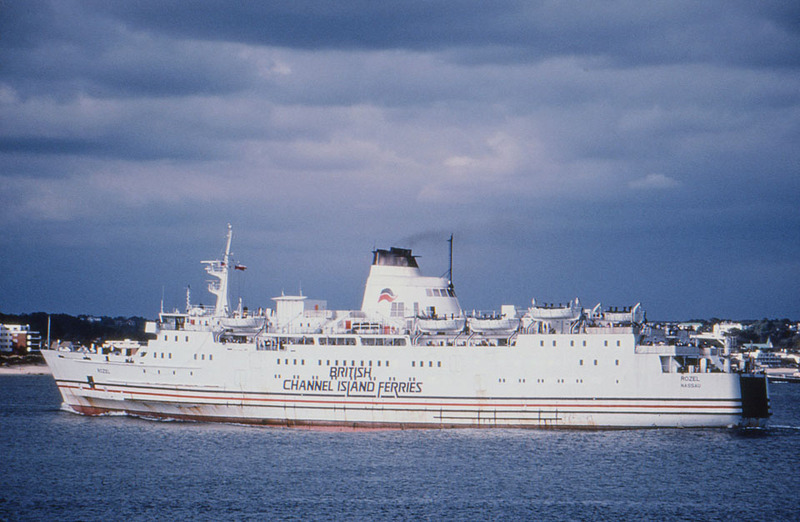 February 1989: Chartered to British Channel Islands Ferries. 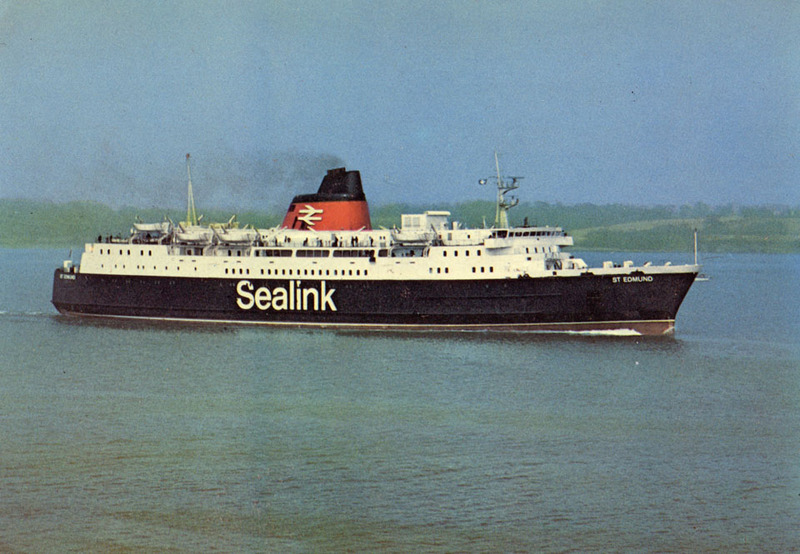 January 18th 1992: Final voyage from Poole to the Channel Islands, then renamed SCIROCCO. 1992: Again chartered to Cia. 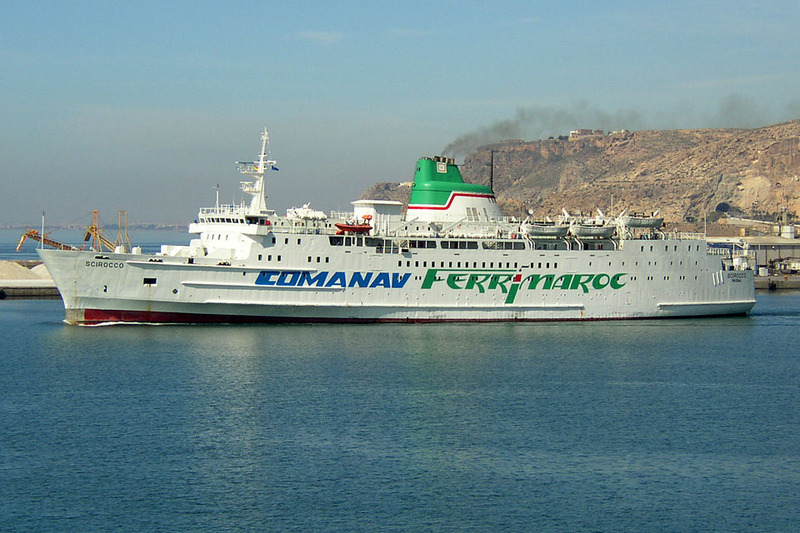 Trasmediterranea, Spain and introduced between Malaga and Melilla (North Africa). 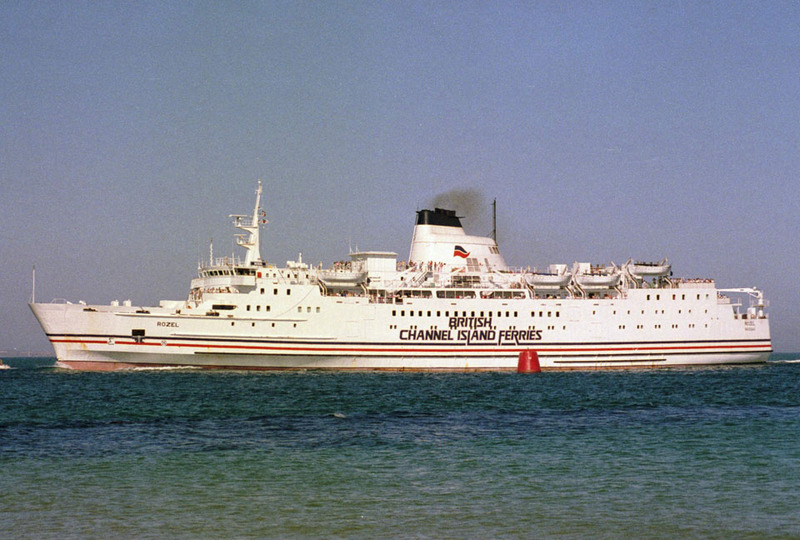 May 16th 1993: Used by FerriMaroc between Almeria and Nador operating under the Gibraltar flag. 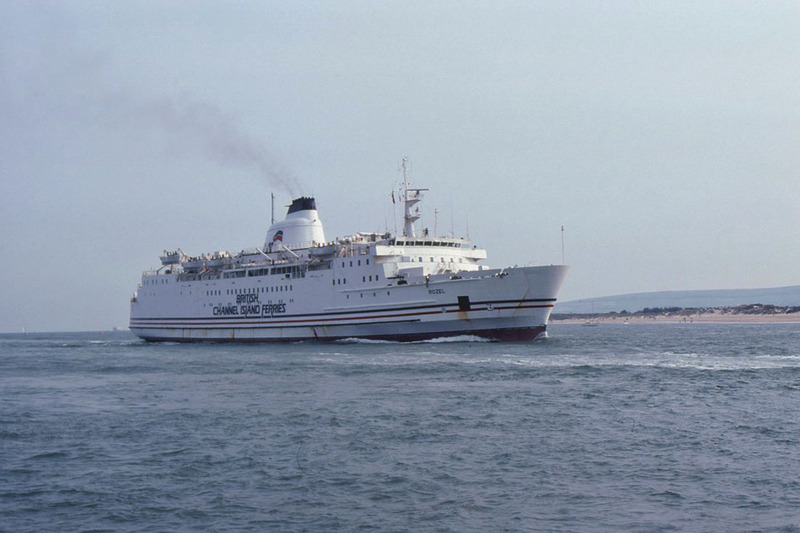 1993 (summer): Chartered to Compagnie Marocaine de Navigation (COMANAV), Morocco. 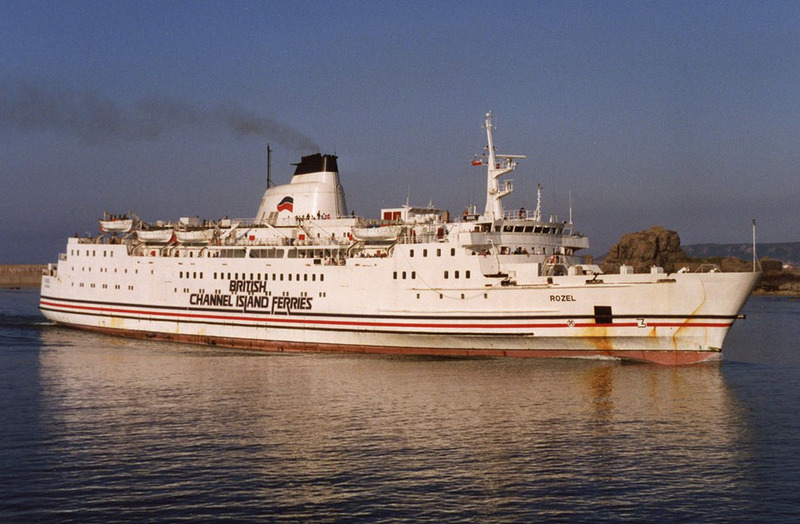 Commenced service between Nador – Port Vendres. 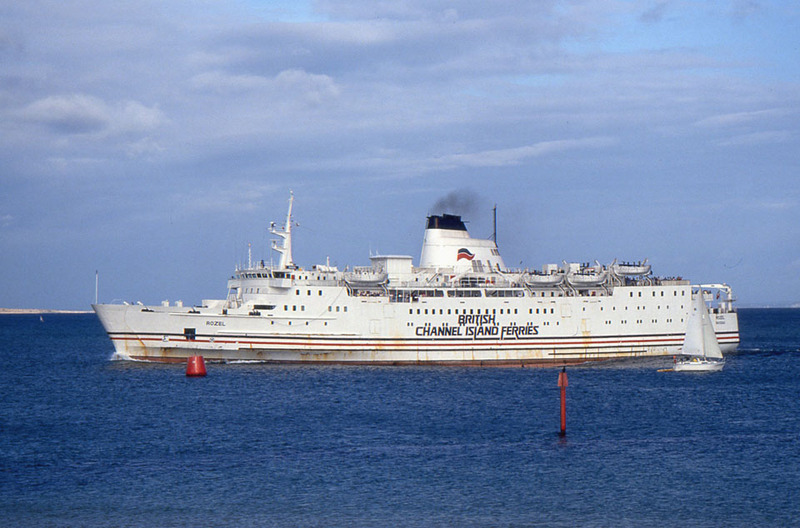 1994: Chartered to Cotunav, Tunisia. 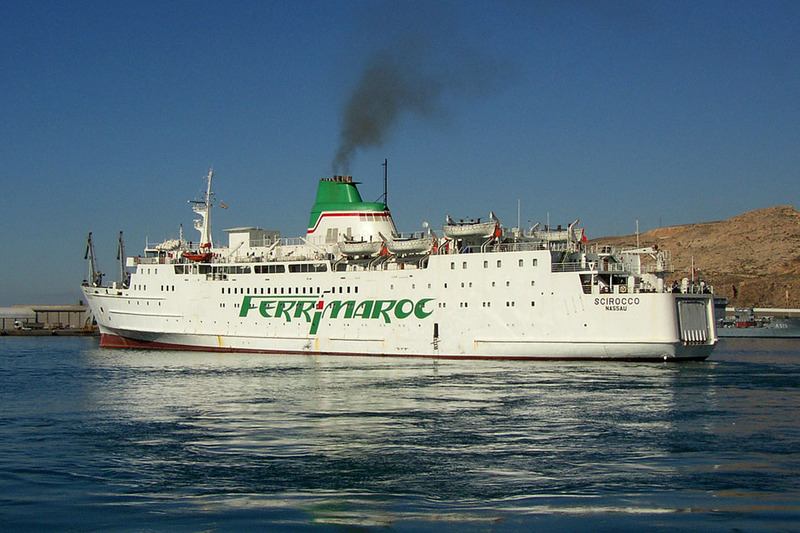 Operated between Genoa – Tunis. 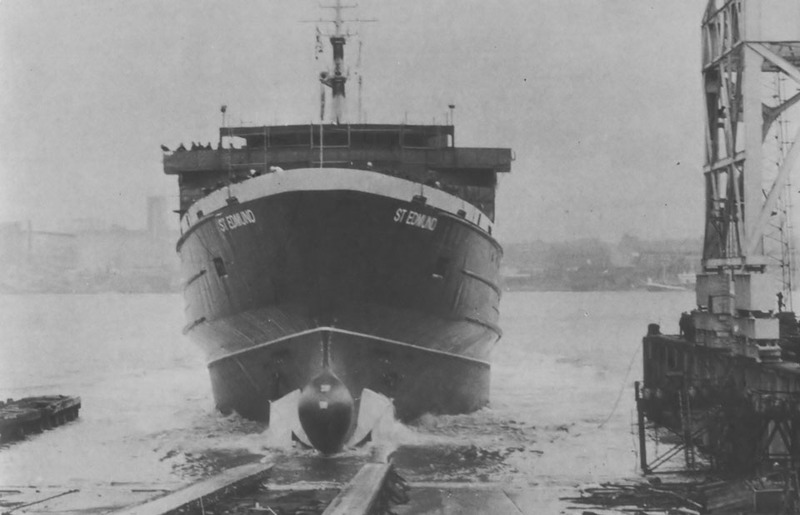 Registered in the English Ships Register, home port London. 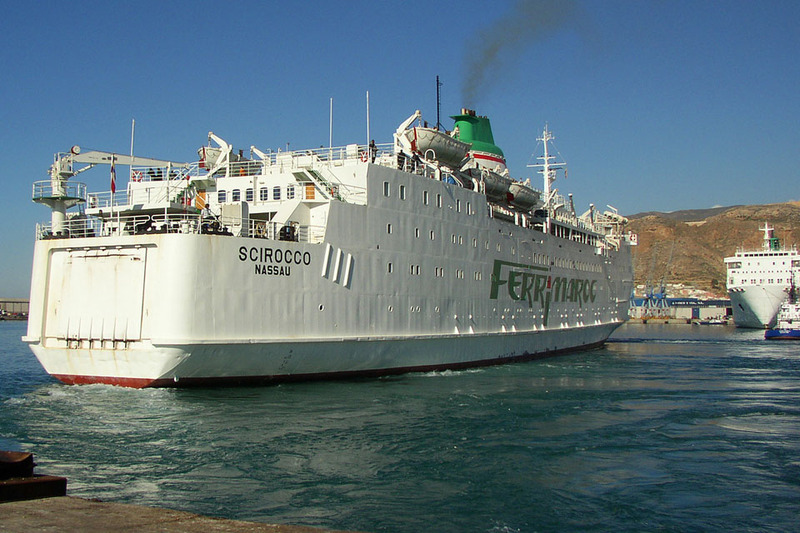 November 15th 1994: Introduced by FerriMaroc between Nador – Almeria. 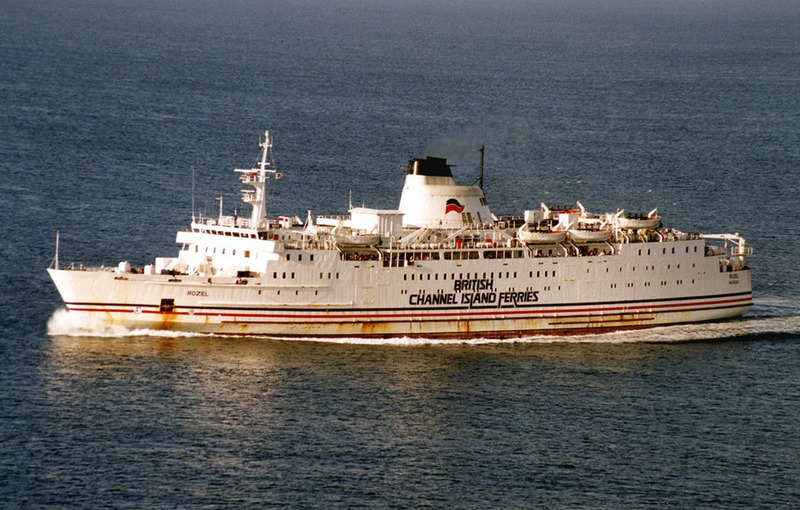 1999: Changed her port of registry from Nassau to the Bahamas and continued for FerriMaroc /Comanav between Nador and America. 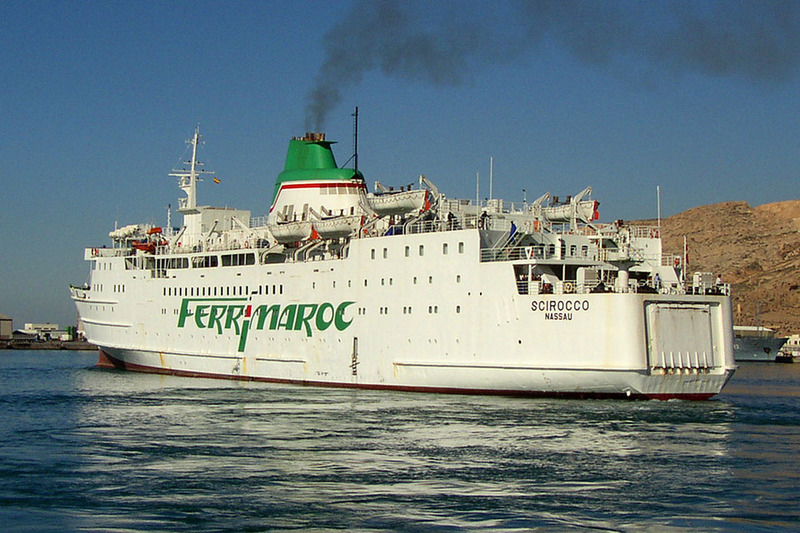 June 2003: Introduced by FerriMaroc / Comanav, Morocco between Nador – Almeria. 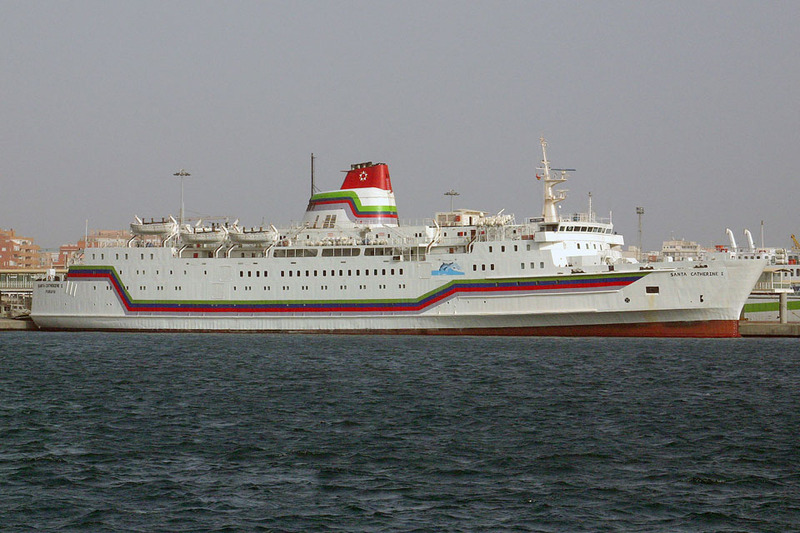 April 2004: Sold to El Salam Maritime, Egypt for delivery in May 2004. 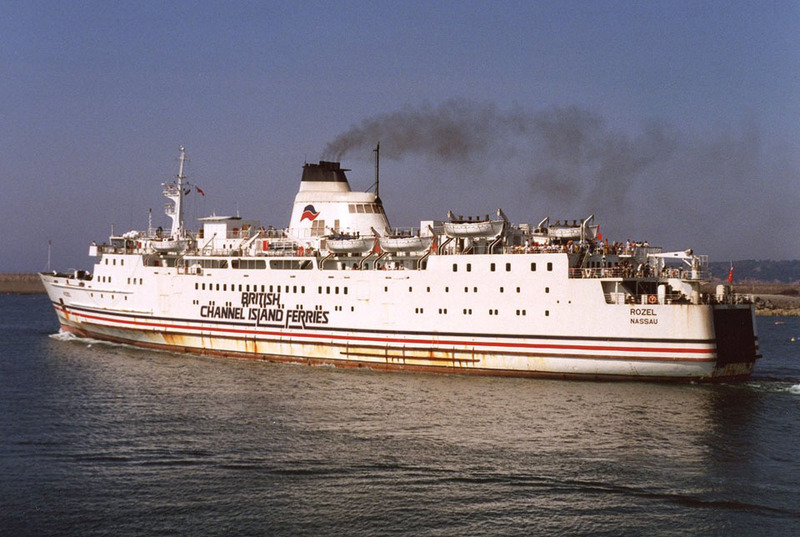 May 2004: Taken over by her new owners (Registered for United Pacific Navigation, Panama). 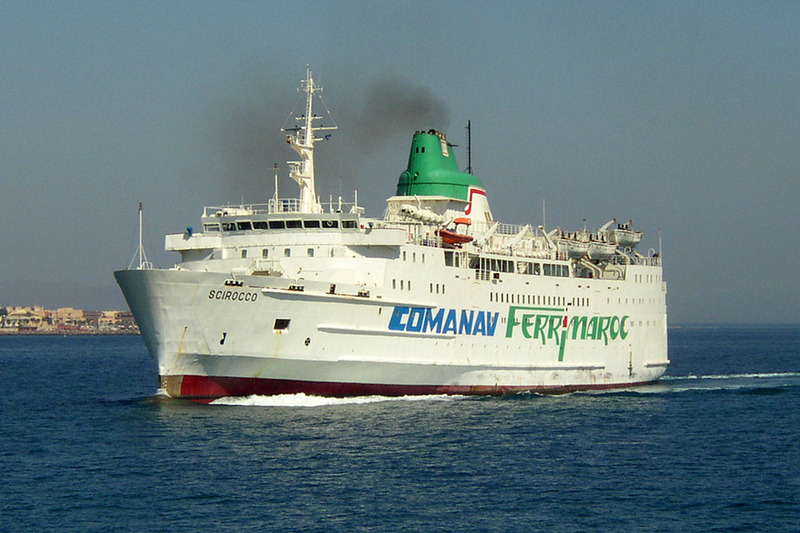 Renamed SANTA CATHARINE I.
June 2004: Immediately chartered to Comanav for use on the same route. 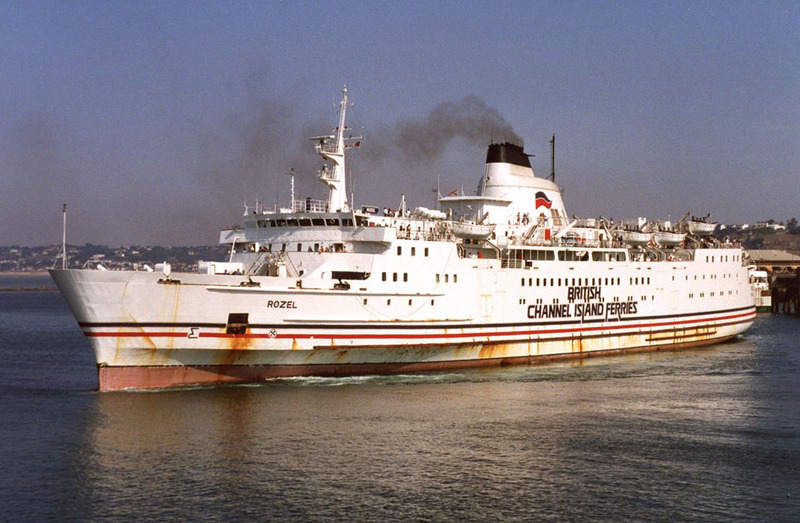 2005: Chartered to Algerie Ferries. 2005 (Autumn): Pilgrim services from Suez. May 30th 2006: Renamed SARA 3. 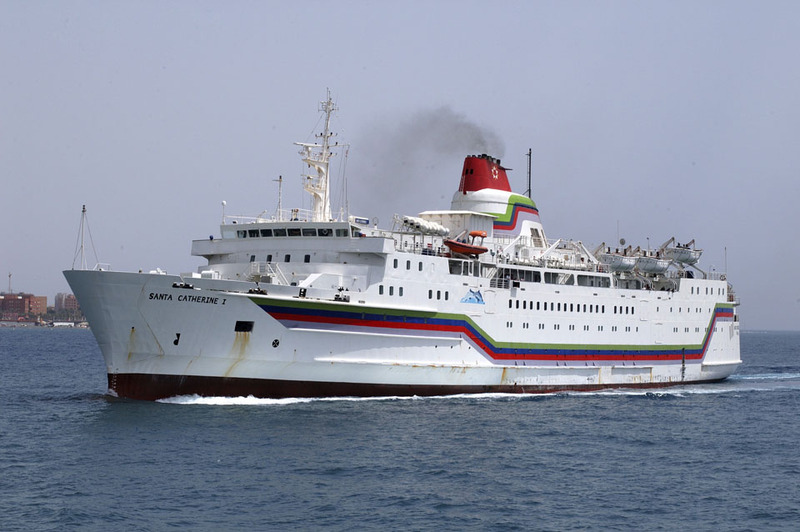 2008: Laid up under the ownership of Arab Ship Management Ltd (Syria). June 2009: Sold to Indian breakers. All information is believed to be correct and no responsibility is accepted for any errors or omissions. All items included in this article are subject to © copyright. We would like to take this opportunity of thanking: Mike Barker, Terry Conybeare, Brian Fisher, Tony Garner, Frank Heine, Patrick Hill, Ken Larwood, Ken Lubi, Carlo Martinelli, Kenny Whyte, Tim Webb and Andreas Worteler for their assistance in producing this feature. Very interesting to read the full story after she disappeared below the horizon. 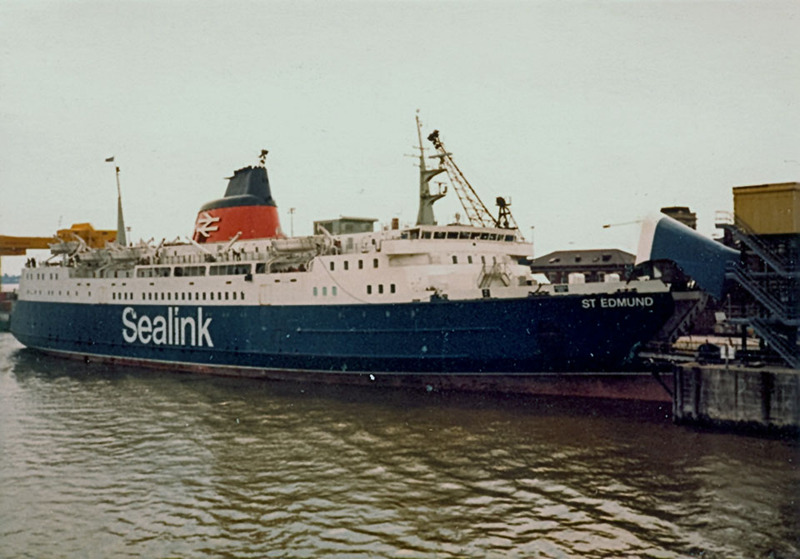 I sailed on her in 1977 from Parkeston to the the hoek of holland as galley boy for several years. 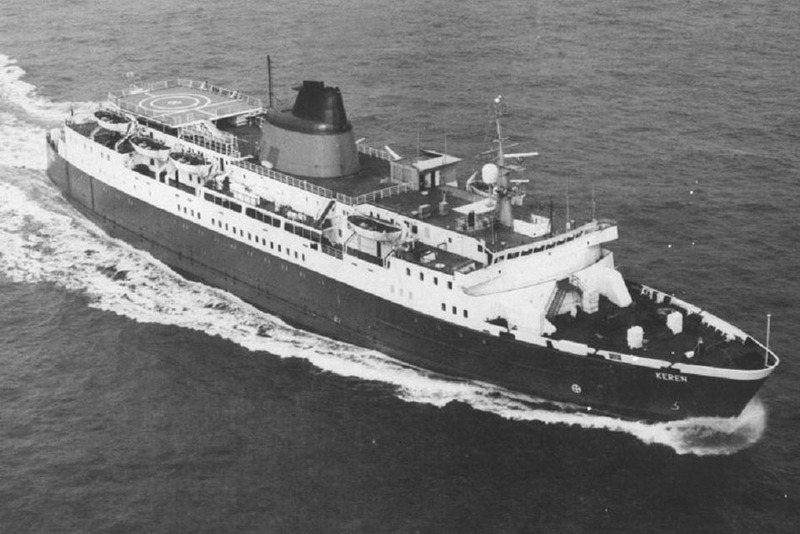 My father was on her too and spent two six moths tours on her in the Falklands. Any photos from these periods? 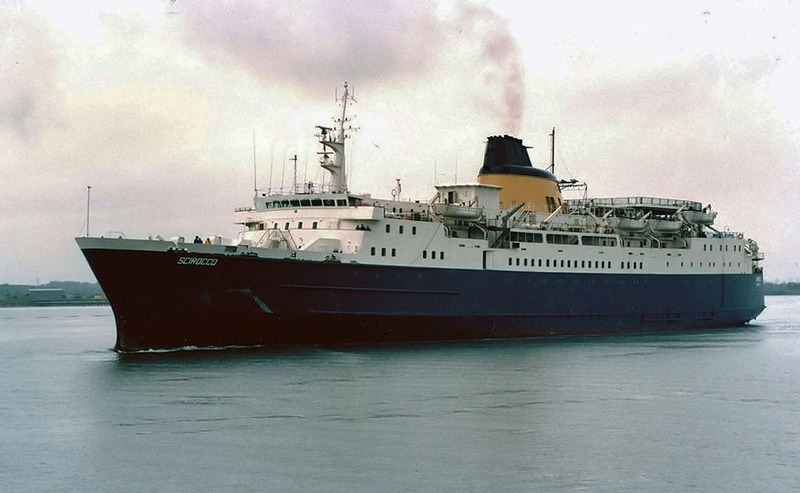 the best ship I ever sailed on I just loved her. 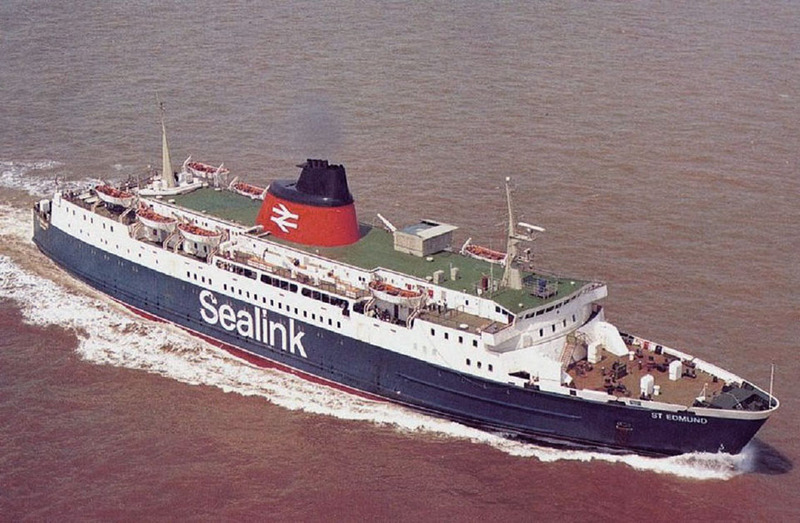 so sad to see the end of her to a breakers yard in India. 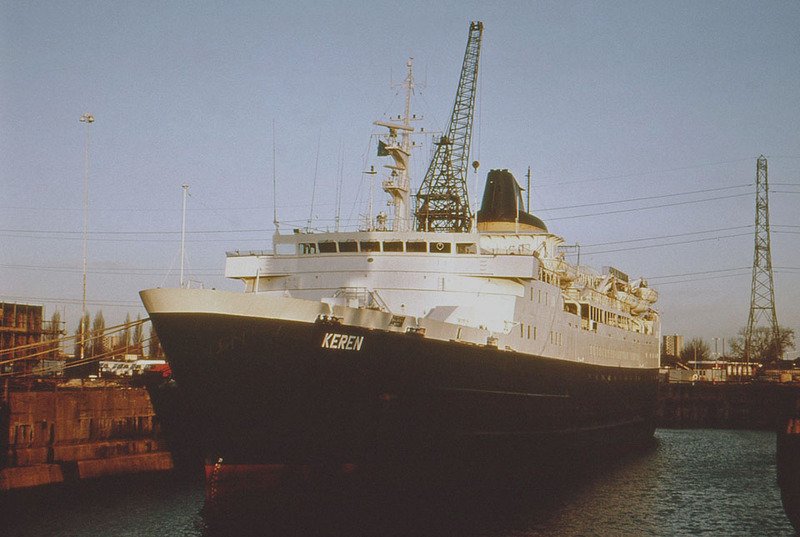 the happiest days of my young life working on that ship. 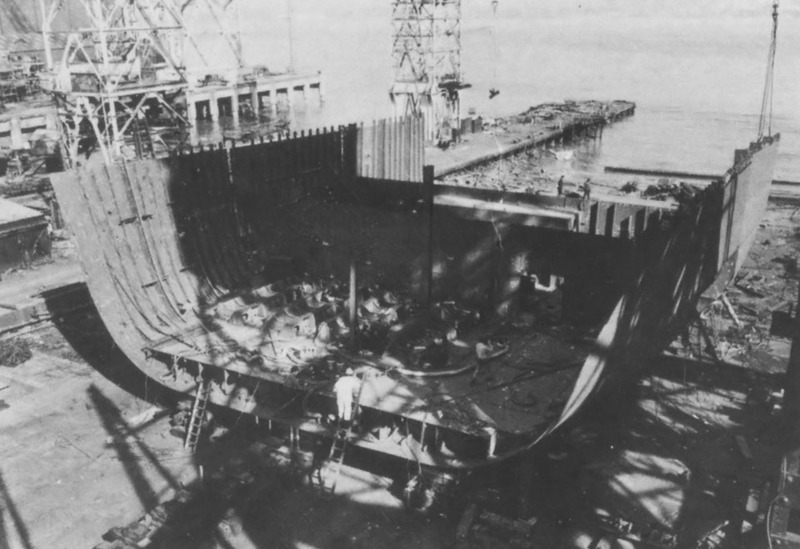 the nicest men an women I would ever meet all working on that ship. St Edmund and all the old crew, thanks for the memories. Are you one half of the Billy and Eamonn duo!! They were happy times, but hard work, especially that 64 bed section – which I seemed to get most times – and never had time to get breakfast in the morning – unless you brought one down for me, as you sometimes did. All told I did 4 summer seasons on there and often look back and think of the laughs we had and those Barclay Blue beers, which kept us going. By the way those ceilings you and Eamonn did for me are still looking good, – hope you can get in touch and we can reminisce. 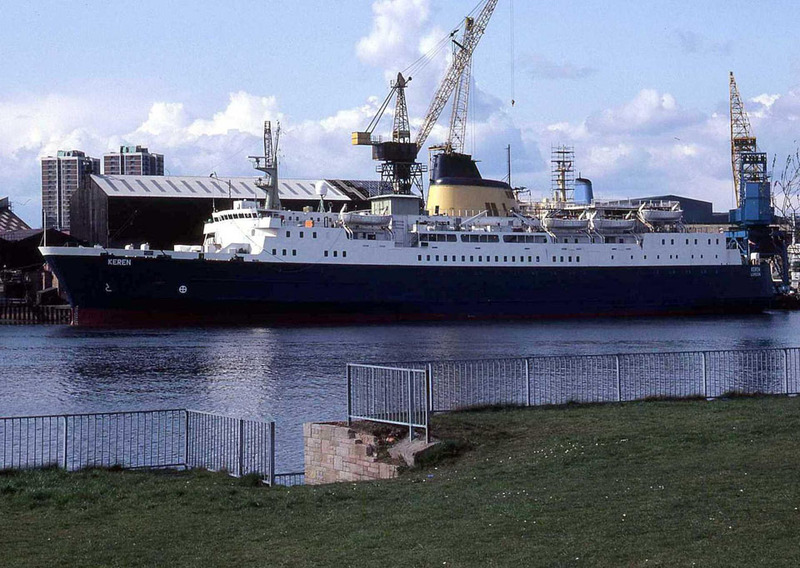 worked on her lairds in 1976, played football on car decks at lunch time,nice ship good times. 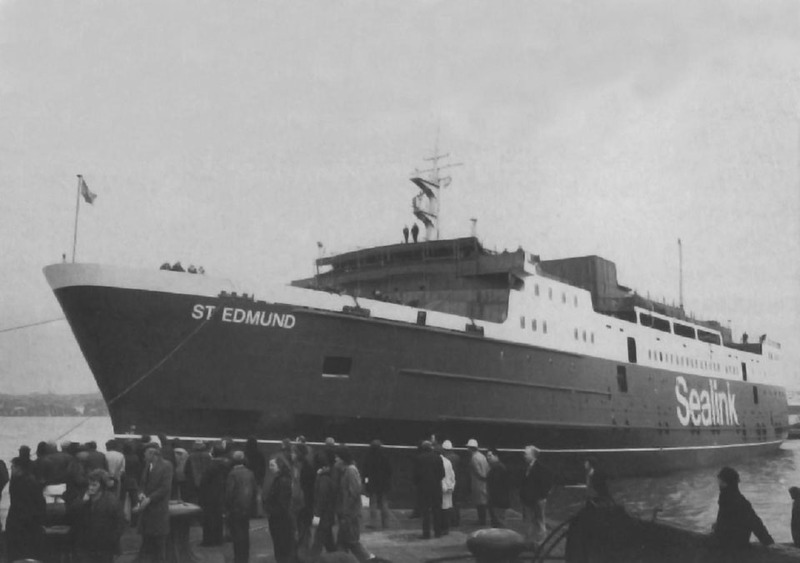 Sailed on her as St Edmund to Falkland Isles 1982. A bit worrying going through roaring forties, good fun had by all crossing the equator,but from then more serious role preparing for war.Was part of 5 Brigade , 17 Port and Maritime Workshops REME. Well done to crew for getting us their safely,along with all military colleagues of course. Sad end to a piece of my life history. CPL SAM TOMLINSON REME. Thank you very much for leaving a comment on this post. 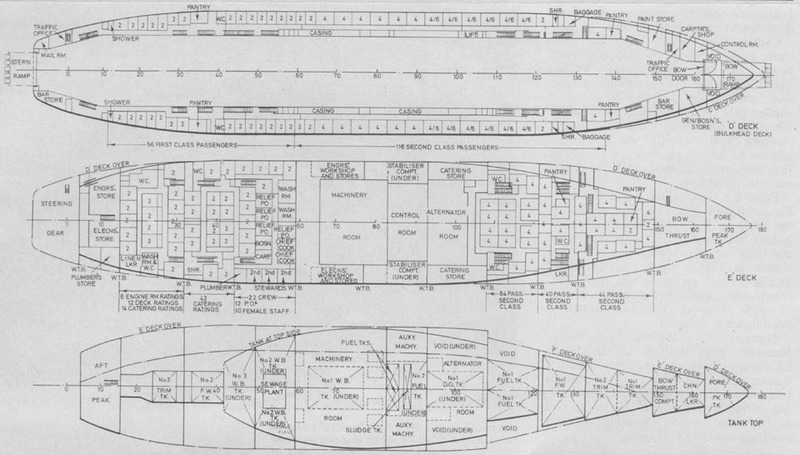 It’s always good for us to hear a website visitors personal recollection of a vessel and what it actually means to them. 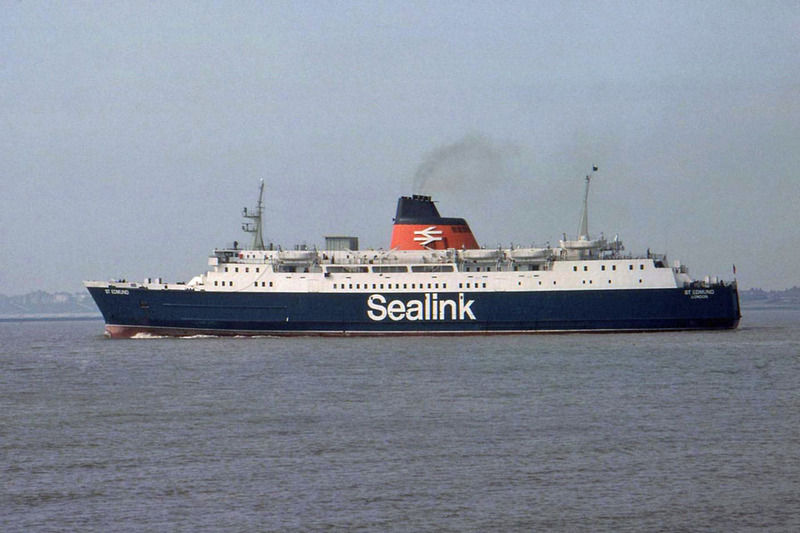 I travelled only once on the St Edmund between Harwich and Hoek van Holland Haven around late 70’s early 80’s and I remembered what a comfortable ship she was. I was a BR employee at that time on my way to Switzerland for a holiday. 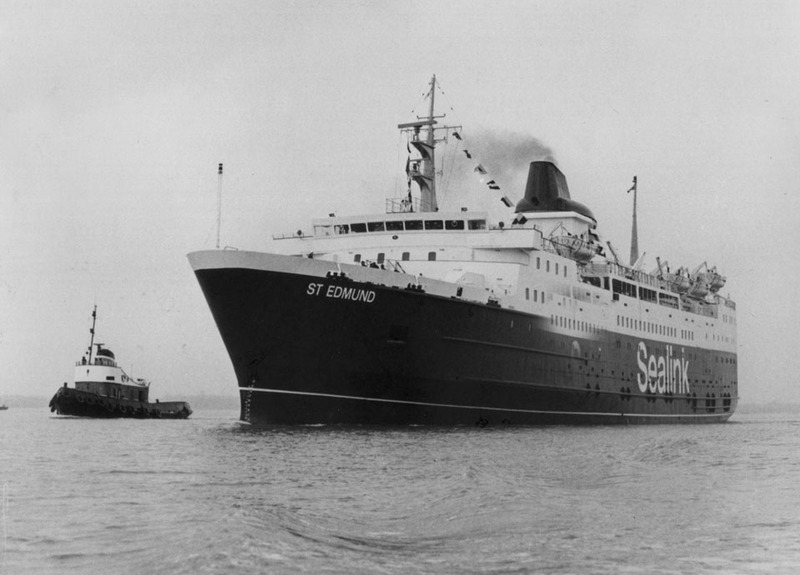 I sailed on the St. Edmond from Devonport to the Falklands in May 1982, I was a seaman on Mexeflote raft for 17 port and maritime regt.